Good pathway and access design and its construction for a site takes into consideration how all people interact and use the space. They should be accessed and usable by those with limited mobility, whether that be wheelchair users, children in pushchairs, families with small children, people carrying luggage, older people, and to those with sensory impairments. In its principles for inclusive design, the Design Council outlines that firstly, “inclusive design places people at the heart of the design process” and creates “environments that are convenient and enjoyable to use for everyone”. Therefore, the importance of building a route and communal space which utilises coloured hard landscaping to benefit and celebrate a community’s diversity cannot be underestimated. Whether it is park footpaths, school surfacing, or decorative driveways, installing a pathway which enables everyone to be active, move around easily and commune has far reaching positive effects on the individual and the collective. Sport Scotland recommends a minimum pathway width of 1.8m to facilities. The Sensory Trust states that 2.0 metres will allow two wheelchairs or two people to move side by side. A camber will allow surface water to run off to the sides. But if this is too steep it can pose a problem for wheelchair users, people with visual impairments and those who have difficulty judging special awareness. 1:50 is the recommended maximum camber but The Sensory Trust prefers 1:100. 1:60 is classed as level, anything between 1:60 and 1:21 is considered gently sloping. Whereas 1:12 is the maximum in British Standards, this is too steep for wheel chair users and people who rely on hand rails for support; especially if they have limited upper body strength. Should a pathway have a continual gradient, level resting points should be factored in to the design and construction. People move at different speeds and sometimes sections of a pathway can’t always meet a recommended width. Creating passing points enables the flow of people along a pathway and avoids disruption. Keeping a pathway fee of surface water requires good drainage systems. Surfacing can be completely waterproof to allow surface runoff into drainage channels or a porous option allows water to drain through in a controlled way avoiding slip hazards and flooding. Making a route and outdoor communal areas suitable for a wide range of users and their needs requires the correct choice of materials. Gravel footpaths are completely unsuitable as the loose aggregate presents a high risk of slipping and is not accessible for wheel chairs, mobility scooters, prams and pushchairs. NatraTex has the solution for surfacing for inclusively designed outdoor access areas. It can be fashioned into a durable level surface perfect for all users. The synthetically bound surfacing is smooth and weatherproof, perfect for those using wheels or are unsteady when walking. An array of colours can be designed to aid the visually impaired with high contrast decorative paving making the pathway easier to see. It can be specified with different porous characteristics to assist drainage and avoid slip factors. 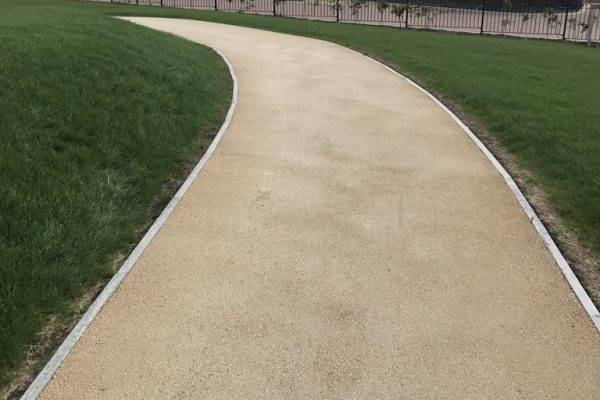 With a proven record of being successfully applied in a variety of settings from residential, retail, education, and regeneration sectors; NatraTex is the perfect material for inclusive pathways and access areas. To find out more about how NatraTex can assist your inclusive access project, please contact us today.